Bangkok is Thailand's capital and its largest city; over 12 million people call it home. On my first trip here the weather was hot and steamy, and the air was thick with smog. We spent much of our time on the Chao Phraya, Thailand's largest river. That river dissects Bangkok and on that body of water much of the country's commerce moves north and south. In this modern city, life along the boat-filled Chao Phraya is a real photo opportunity, as its banks are lined with both modern apartments and businesses, plus rickety shacks where thousands of locals still live and work. We also visited Chinatown, the Golden Reclining Buddha, The Royal Palace and other points-of-interest including the world's largest jewelry store. 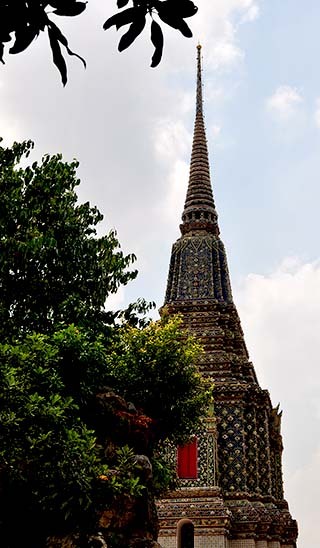 Bangkok is a very exciting place, and I would certainly place it high on my list of favorite travel destinations. You should too! 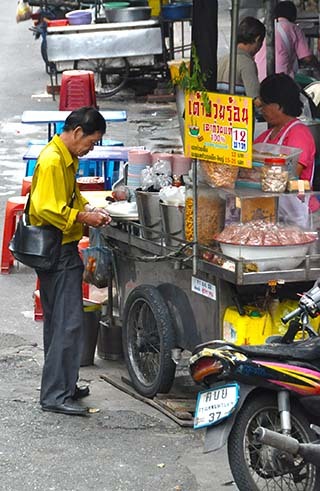 Eating lunch on the street in Bangkok. An unidentified statue in the Wat Pho temple. When you look up in Bangkok, this is often what you see. 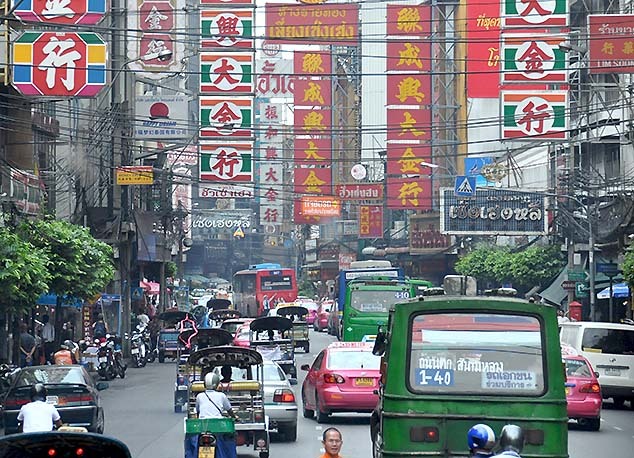 Yaowarat Road runs through the center of Bangkok's Chinatown. Running in all directions from the street are small streets and alleys full of shops and vendors selling all types of goods. Most Thais are Buddhists, but they also mix a bewildering slew of other beliefs. 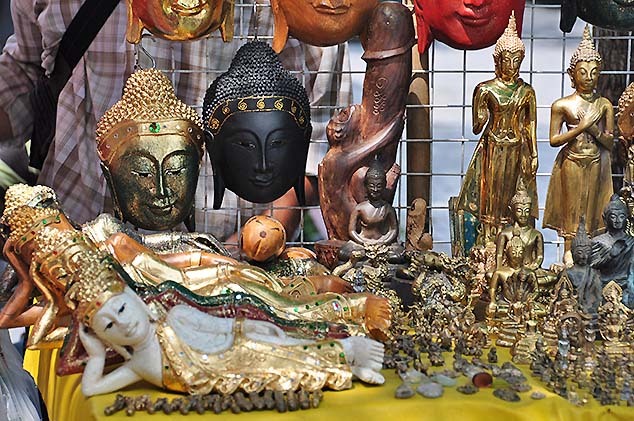 Buddhas for sale on the street come in all styles and shapes, with some made of metal, wood, bone or plaster, and can even include sacred ash from incense and colored dust from a temple's bricks. 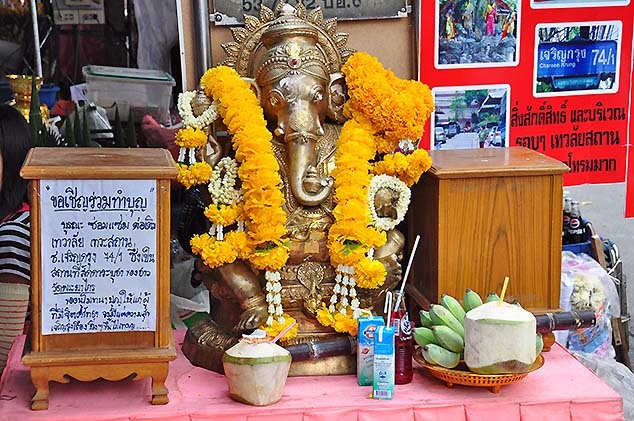 This street shrine in Chinatown portrays Hinduism's elephant-headed Lord Ganesh, one of the best-known and most widely worshiped deities in the Hindu pantheon. 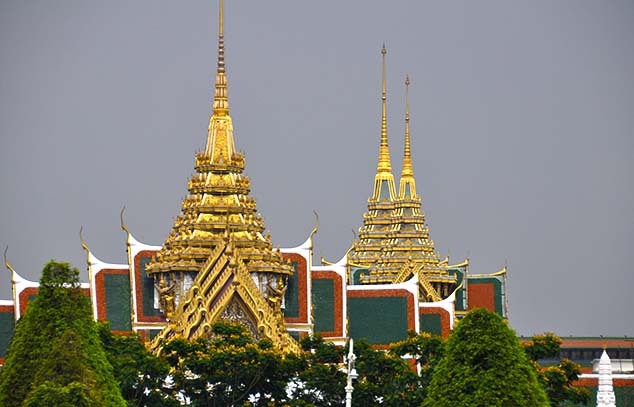 These are three of the Grand Palace spires in Bangkok. The Grand Palace has been the official residence of the Kings of Siam (and later Thailand) since 1782. The king, his court and his royal government were based on the grounds of the palace until 1925. Several royal ceremonies and state functions are held within the walls of the palace every year. 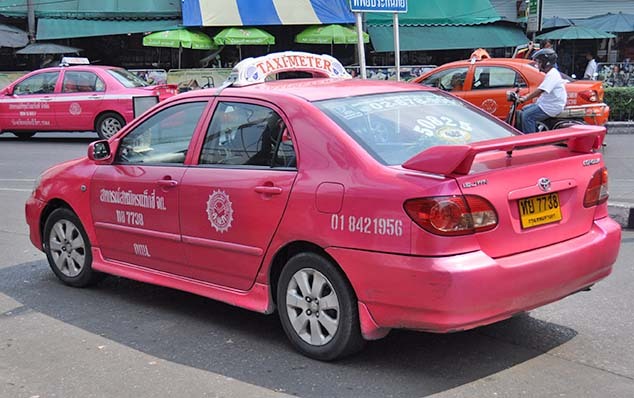 Many taxis in Bangkok are pink; regardless of the color they are one of the best ways to travel within the city, except of course during rush hour which is best avoided. 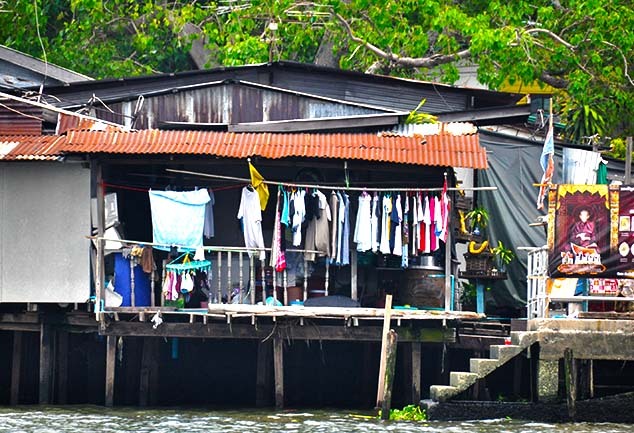 Along parts of the Chao Phraya river in Bangkok, and certainly along many of the spin-off canals, locals live a happy life on water's edge; many of them use their own boats to get around the city. 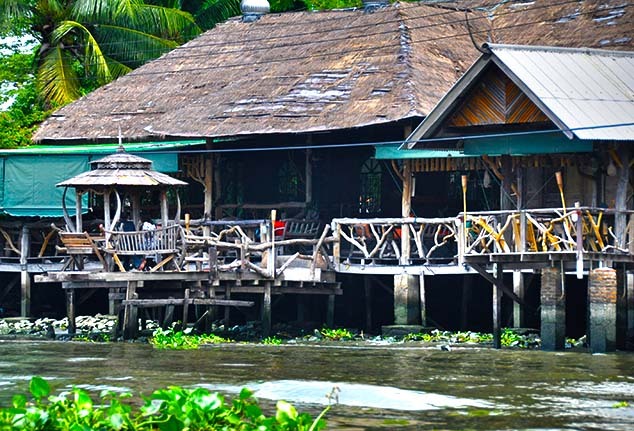 This river house in Bangkok is quite large, and of you look closely you'll notice the wooden furniture on its porches. It may look a bit run down, but is has good support and is very functional. 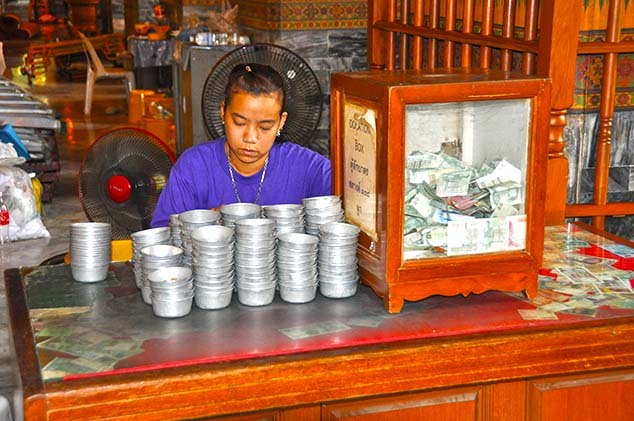 If you visit a shrine in Bangkok, you use a litle tin cup to leave an offering behind, or a tip in the box if you prefer.